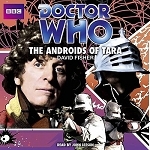 Martin Jarvis reads this thrilling novelisation of a classic "Doctor Who" adventure. The Doctor walked slowly forward into the cul-de-sac. The giant dinosaur turned its head to focus on the midget now approaching...The Doctor aimed his gun to fire...suddenly from behind came a great roar of anger. 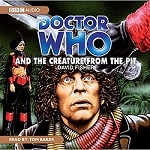 He spun round - blocking the exit from the narrow street towered a Tyrannosaurus rex, its savage jaws dripping with blood...The Doctor and Sarah arrive back in the TARDIS to find London completely deserted - except for the dinosaurs. 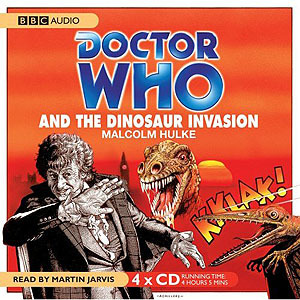 Has the return of these prehistoric creatures been deliberately planned and, if so, who can be behind it all?Martin Jarvis, who played Butler in the original TV serial Invasion of the Dinosaurs, reads Malcolm Hulke's complete and unabridged novelisation, first published byTarget Books in 1976. 'They're well-written books - adventure stories of course, but with some thought...the creation of the character of the Doctor had a touch of genius about it.' - "Westminster Press".